1. Higher wages. On average unionized workers are paid $5.40 an hour or 23 per cent more than those who aren’t members of a union. The union advantage is considerably higher for women and lower paid occupations. 2. Greater equality. 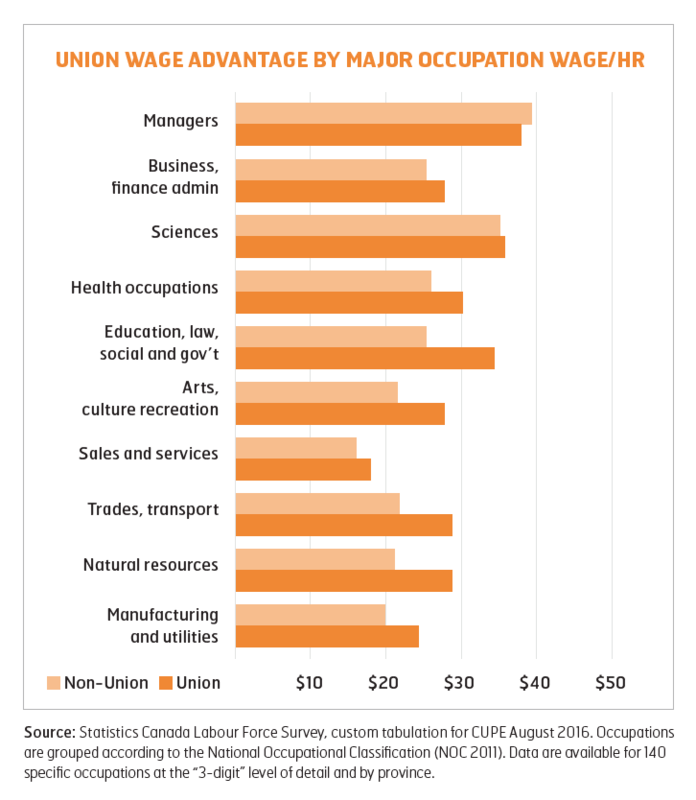 Compensation in unionized workplaces is more equitable overall, with relatively higher wages for lower paid workers and less of a wage gap for women, younger workers and racialized workers. Unions are also recognized for significantly increasing equality across society overall. 3. Pensions/benefits. Over 70 per cent of union members have access to a workplace pension, compared to less than 30 per cent of non-union workers. Union members have better health and other benefits, including leave, than non-unionized workers. 4. Job security and tenure. Unionized workers are more likely to be full-time, permanent and to work longer for their employers. For instance, 14 per cent of unionized workers are part-time, compared to 20 per cent of non-unionized workers; 12 per cent are on temporary status compared to 14 per cent of non-unionized workers; and almost half (49 per cent) have ten years of experience with their employer compared to just 35 per cent for non-unionized workers. 5. Health and safety. Unionized workplaces tend to be safer, with studies for the construction industry showing 30 per cent lower critical injury claims, 17 per cent fewer mobility impairments and 23 per cent lower lost-time claims. Unionized workers are more likely to report health and safety violations and minor no-lost time injuries (due to training, awareness and/or less fear of reprisal), which makes workplaces safer overall. 6. Predictable hours. Union contracts set predictable schedules, standard hours of work, overtime and shift premiums. 7. Training and education. Training and education is a major priority for unions, included as a requirement through contracts and also extensively provided by unions themselves. 8. Transparency and equitable due process. Wages are set by common wage scales and grievance and arbitration procedures provide for due process over disputes. 9. Workplace democracy. Unions provide democratic organizations through which workers can affect change in their workplaces, communities and in the wider world. 10. Advocacy and political action. Unions have paved the way in improving conditions for all workers, levelling the playing field so that non-union employers have to compete with them to attract workers.